We are finaly here! 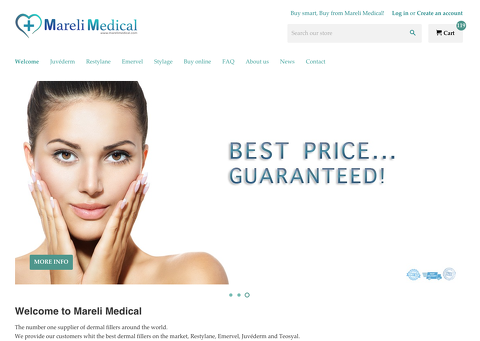 – Mareli Medical your supplier of dermal filler. Home › NEWS › We are finally here! Good and hard work pays of, and finally we reach a new chapter on Mareli Medical! A while ago, we sat down and thought about how we could make it easier, more efficient and more profitable for our customers to buy from us. Now finally our E-commerce is online! Here you will see our range of dermal fillers to increase , constantly have the best prices in the market and we are here 24/7, 7 days a week . Should any problems or questions rise ,please contact us. All purchases go directly through one of the world's most secure card payment, Pay Pal. All deliveries go via FedEX, WORLD WIDE. Welcome to Mareli Medical Shop!